CIY 2.0– hot swappable optical switches, change it yourself, custom your favorite light strike optical switches easily. DIU RGB – DIY interesting & useful RGB backlit, fully user-defined. SSP – smart software programming for multiple programmable layers. MagicFinger – innovative visual smart driver software, just like you have a magic finger, pointing any key into what you want it to be. 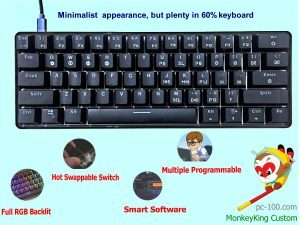 Best buy 60% keyboard 2017— good and fun compact mechanical keyboard at budget price. 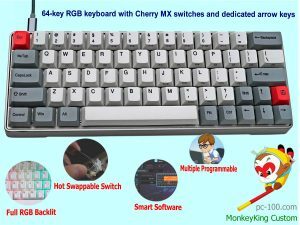 From PCB layout, switches’ choice, keycaps’ materials and characters printing… our MonkeyKing Custom team begin the innovations. 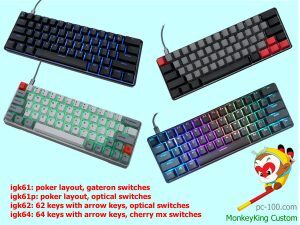 Our target is :Make best 60% mechanical keyboard, users’ favourite compact mechanical keyboard at good price. Designed for laptop users, it’s easy to take on the go. Trying out different switches, replacing old ones, and matching several types of mechanical keyboard switches used to be difficult and required extreme technical skill. 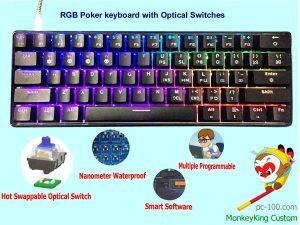 Now SuperMonkey series optical mechanical keyboards are designed to allow you to change your key switches without the hassle of soldering. This caters to anyone who uses their keyboard for multiple purposes. Switching from gaming to typing, for example, might require that you swap your Linear switches to Clicky ones. 4 fully programmable layers include 3 on-board ( we call “offline” ) programmable layers and 1 online programmable layer. With the visual software operation, just like you have a magic finger, pointing any key into what you want it to be at any programmable layers. According to your typing habit, any layout you like can be configured it into. Keyboard shortcuts are the hallmark of a speedy editor. The more shortcuts you’ve got memorized, the faster you will be. 1 layer keyboard for design working: have macros keys, shortcut keys…. You can toggle among 3 offline ( onboard ) layers easily, just by typing Fn+w for opening the layer, once again typing for closing the layer. The same operation of typing Fn+e, Fn+r for another 2 offline (onbaord) layer’s opening and closing. Also with cloud driver software “MigicFiner”, DIY interesting & useful RGB backlit, fully user-defined. For primary keyboard users to enjoy cool RGB keyboard easily. User define per-key”s backlighting for unprecedented customization and control. For example, game players can define the RGB colors for WASD keys, strengthen the gaming experiences, so cool. For senior keyboard players, deliver dynamic and vibrant lighting effects with virtually unlimited customization. User may set multi light effects for 3 offline (on-board ) layers and 3 configurations of the online layer, and also can set multi light effects for default (standard ) layer. This function is very useful. Eg: It can let you know clearly which kind of the keyboard layer you are working at, and in which kind of mode the key is. 8M onboard memory for storing layouts, macros, hotkeys, shortcut keys… and the lighting profiles. User can carry it and use it on multiple PC’s , without needing to install software on all of computers. More fast transfer speed, matching with fashion high- tech professional computer & gaming supercomputers perfectly. Real high performance PC peripherals. The RGB light effect can bounce along with the rhythm of music. Magic entertainment function, relaxing yourself when you are in the working gaps. An amazing keyboard. 100% anti ghosting with USB full key rollover, ensure your commands and simultaneous keystrokes always register the way you intend. Power saving mode: When the computer is on standby or shutdown, this mode launched. Keycaps are made from PBT: a durable plastic that will not wear out over time, unlike some other keycap materials. Dolch laser-engraved discreet front printed keycaps, feel concise to workplace elites. Portable, travel with the keyboard for multi occasions using, quite convenient for outworker. 3. Portable design, suitable for working and gaming on-the-go. 4. 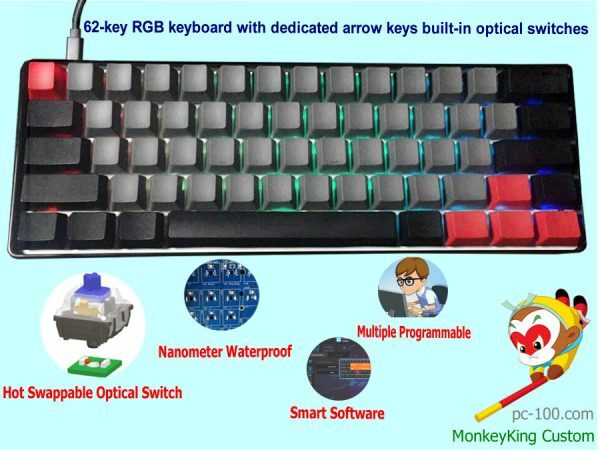 Best buying keyboard, suitable to young man, boyfriends as Christmas gifts. In China, there is a very famous mythic fiction “Pilgrimage to the West”. Nearly every Chinese know there is a very smart & ingenious monkey in it. He is called Monkey King. Actually, he is a immortal. When he want to somewhere, he can fly in the sky, and always with a piece of colorful auspicious cloud underfoot. Very magic. He has a very magic weapon, it is called golden cudgel. It is come from the East China Sea Dragon Palace, and it’s the priceless treasure in the dragon palace. Monkey King get it. And this golden cudgel is very magic & powerful. At ordinary times, it is just as small as a embroidery needle, and always be put in the Monkey King’s ear. When Monkey King fight with the monster, the golden cudgel can become huge momentarily, even can reach the heavenly palace, extremely powerful! Monkey King is also a magic monkey, he has the ability of 72- changes. In any necessary occasions, he can change himself into what he want to be.